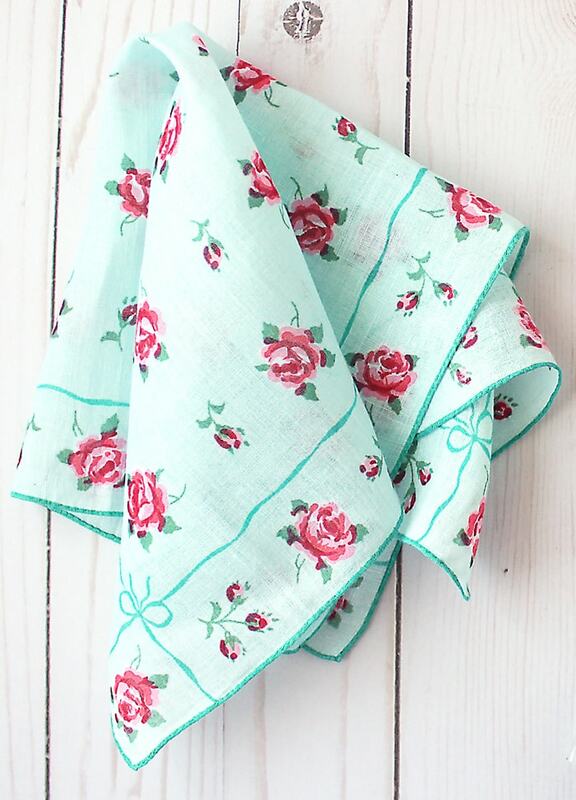 When going through my great grandmother’s things, we found a few beautiful old handkerchiefs. Not knowing what I would do with them, I took them home until I came up with an idea. 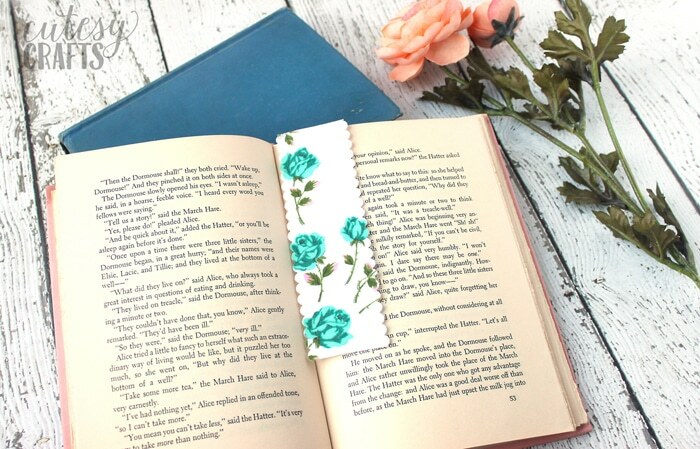 I finally found a use for some of them and made a tutorial for how to make bookmarks from fabric. 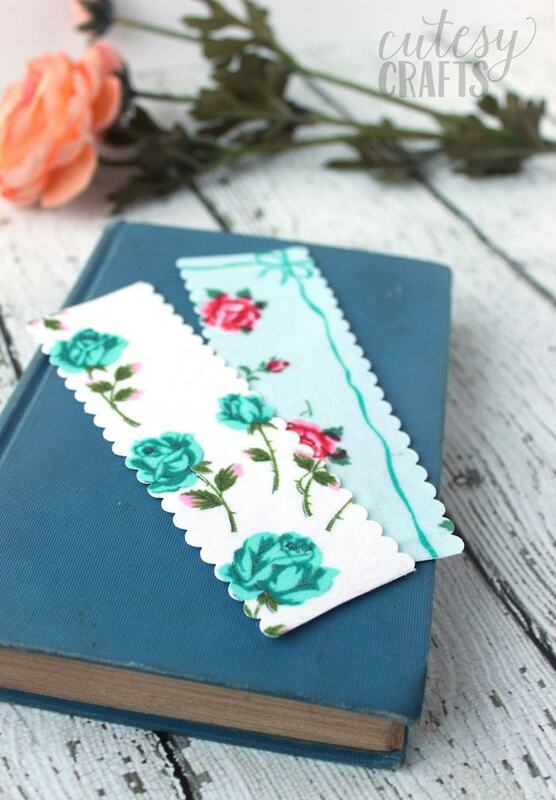 They are completely no-sew fabric bookmarks, so anyone can make them. 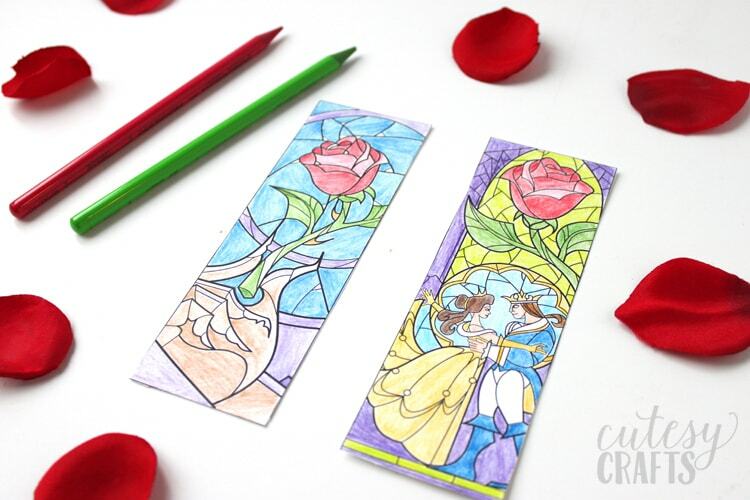 If you like this project, make sure you also check out my DIY Bookmarks post. 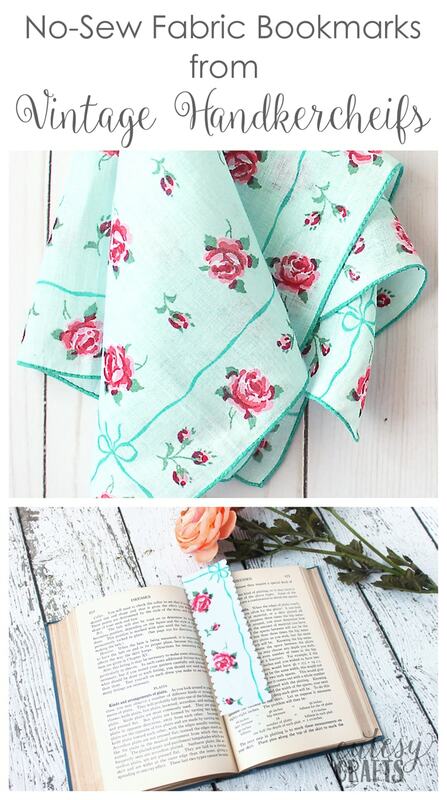 Now I can enjoy the beauty of the old hankies and think about my great grandmother every time I use the bookmarks. 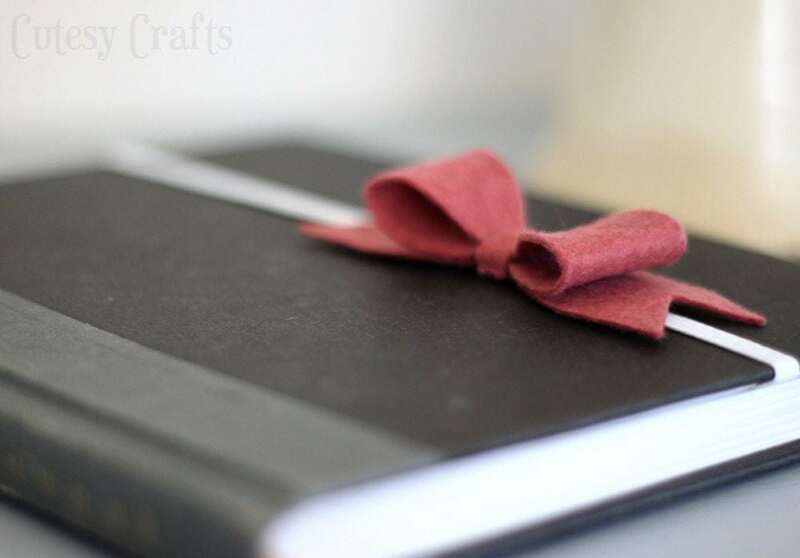 Start by drawing a 2 x 6 inch rectangle on the paper side of your interfacing. Position the interfacing, paper-side-up, on the “wrong” side of your handkerchief. Iron it down and let it cool. If your handkerchiefs are thin, like mine were, use a piece or parchment paper to protect your ironing board from the interfacing. The stickiness on mine seeped through a little. 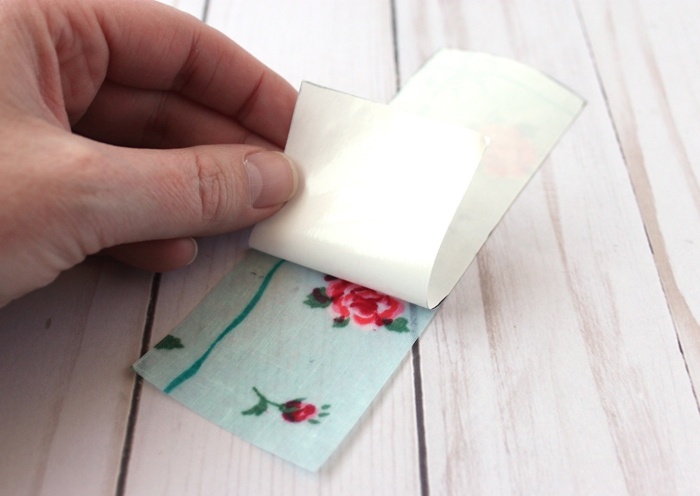 Place your rectangle on top of your thicker fabric, with the interfacing side down. Make sure it’s a solid fabric with no print. White worked great for mine! Iron it down and let it cool. 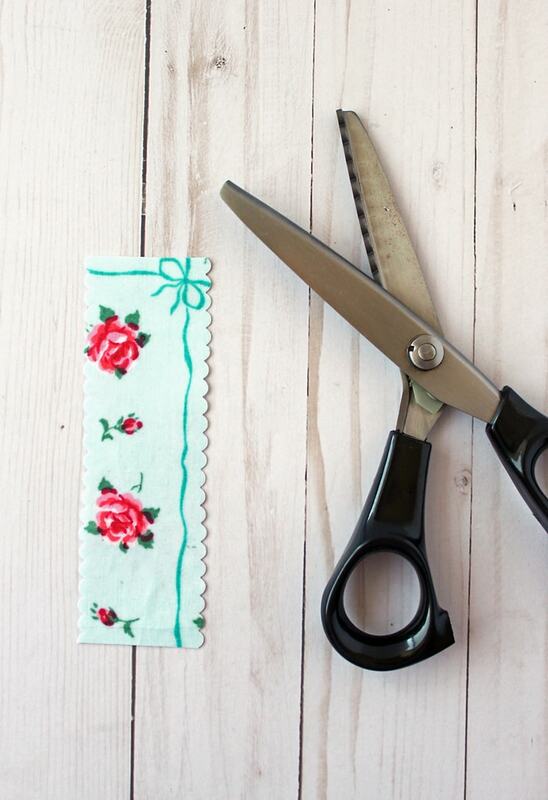 Cut out your rectangle again, with some fabric scissors. Then trim both sides with the scalloped shears, to make a pretty design on the edge. You can use regular pinking shears for this as well, but I really like the scallops. 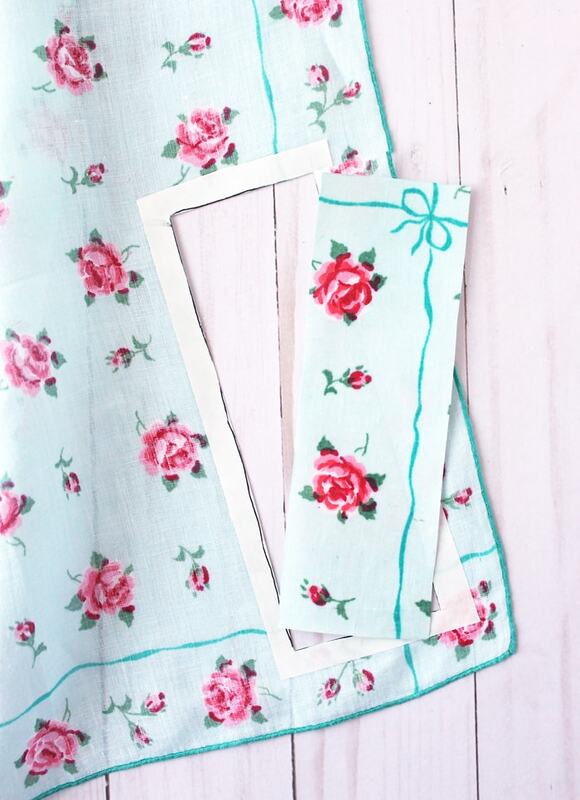 You can totally play around with this tutorial and use different scraps of fabric. They don’t have to be handkerchiefs. 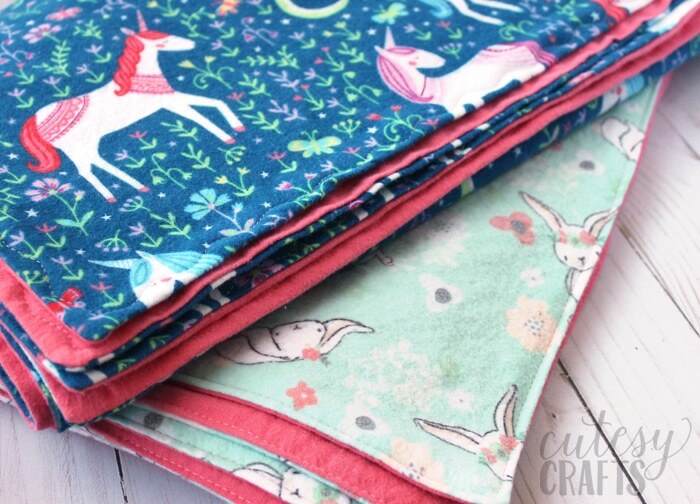 I made some for my girls with scraps of some unicorn fabric that I had sitting around. They love them! 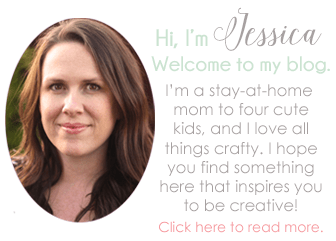 You might also like these DIY Key Fobs from Woodberry Way. 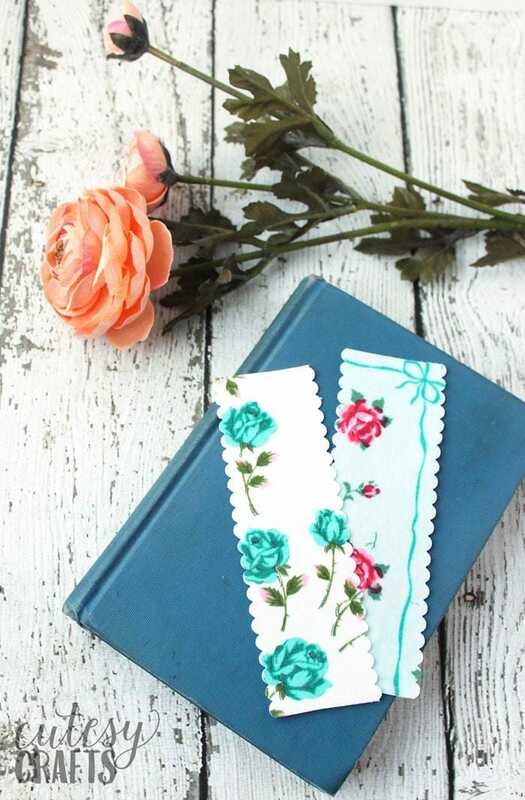 Learn how to make bookmarks with vintage hankies or scraps of fabric. No sewing required! 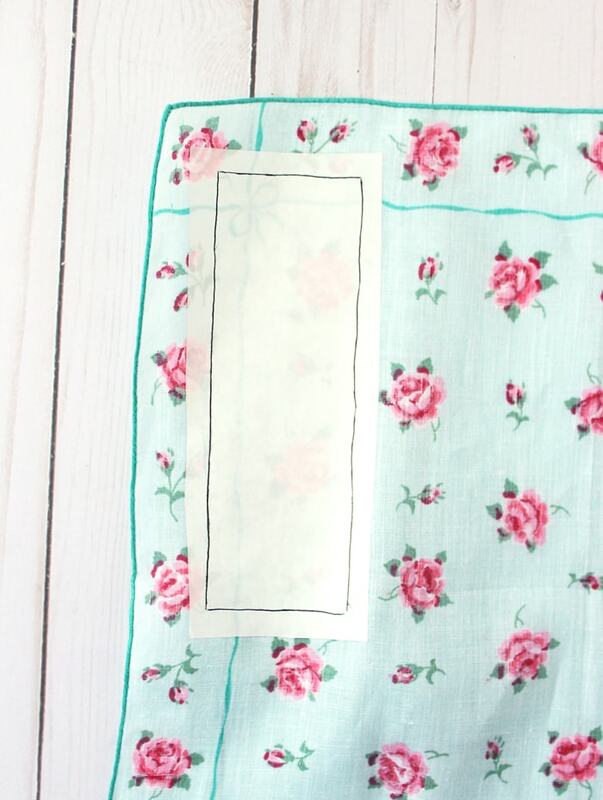 Draw a 2 x 6 inch rectangle on the paper side of your interfacing. Position the interfacing, paper-side-up, on the "wrong" side of your handkerchief. Iron it down and let it cool. 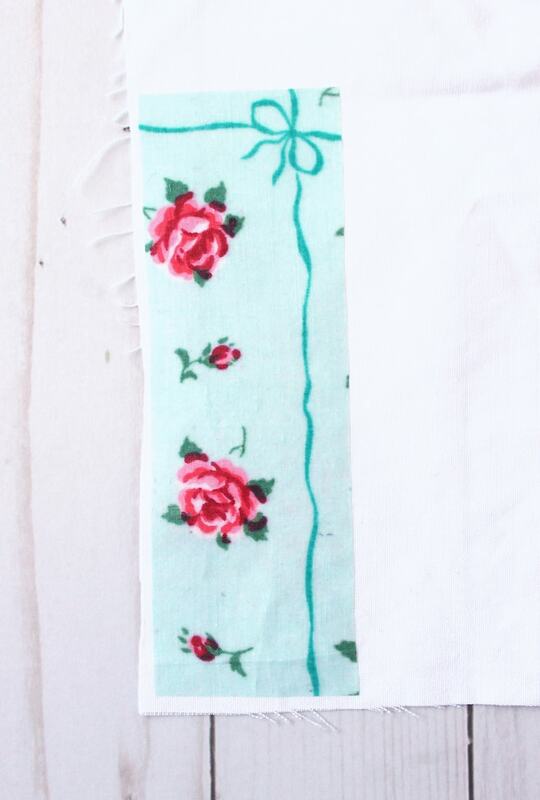 Place your rectangle on top of your thicker fabric, with the interfacing side down. Iron it down and let it cool. Cut out your rectangle again, with some fabric scissors. Then trim both sides with the scalloped shears, to make a pretty design on the edge. 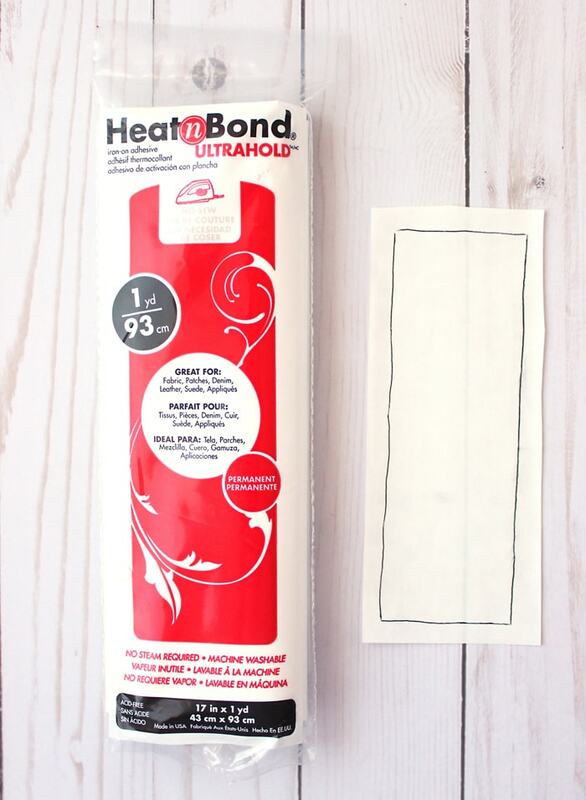 Use parchment paper to protect your ironing board. That’s a great idea!! Love this. Oh good ideas! I bet the tablecloths will look really cute!